Here in North Carolina, spring and fall is a charm in the garden, but when the heat of summer arrives, many plants can take a real hit from Mother Nature. Need some inspiration for low watering garden decor? 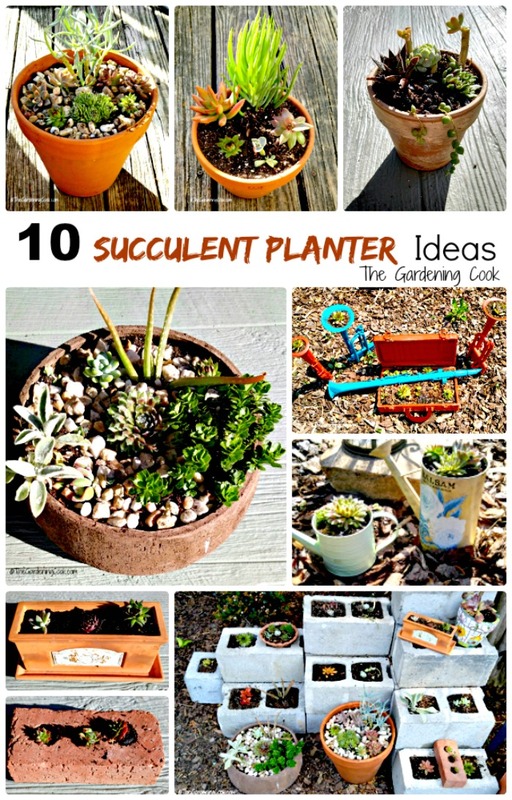 Try Rustic Succulent Planters. I love the easy care and pretty shapes that succulents form. One of my projects, last week, was to pot up a batch of succulent planters to put in my Southwest themed garden bed. 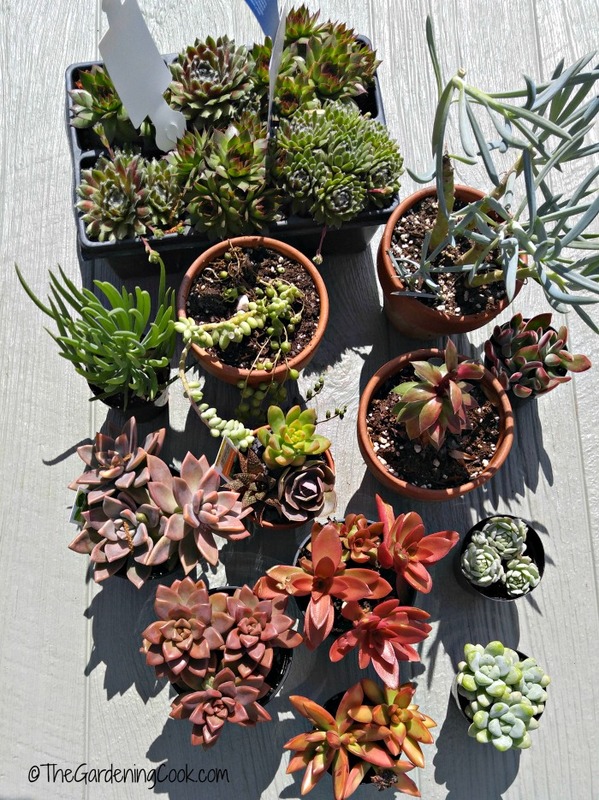 I took a trip to my local garden center and came back with a table full of succulents, all ready to arrange into some clay plant pots. I have a bunch of them that I’ve amassed over the years and they are perfect for succulents. The clay color goes so well with the plants and they drain very well. 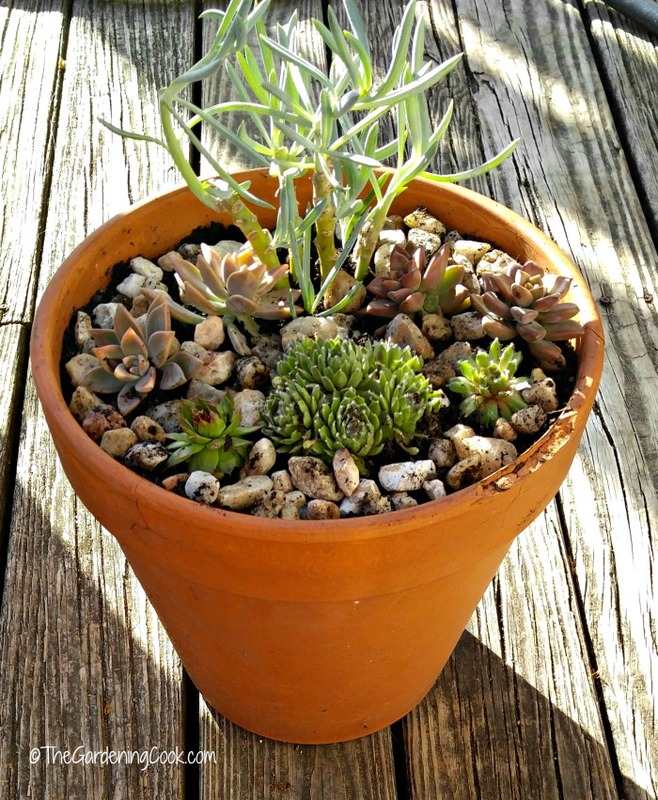 Since most succulents prefer a dry soil, using clay pots that drain quickly is a benefit for them. A few of these are some plants that I brought in last year that had gotten leggy and needed a re-pot, but most were new purchases and I could not wait to get going on the project. I grabbed a big bag of Cactus and Succulent soil and set about getting my plants into pots. I also used some stem cuttings and leaf cuttings to propagate the succulents and get more plants for free. See how I did this here. I had a variety of pots. 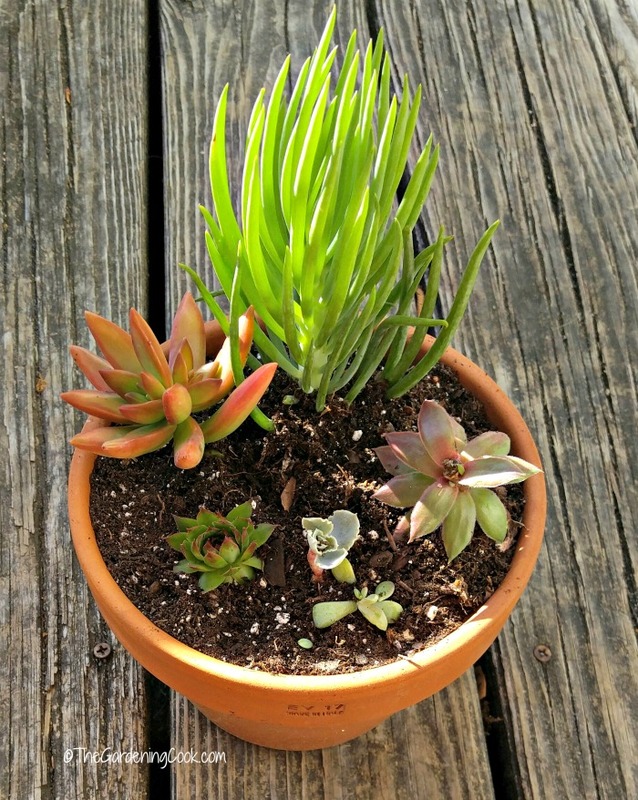 Some were shaped like bowls, a few were watering cans that were in my mother’s garden, some were normal 4 and 5 inch pots and others were decorative pots or larger planters that I planned to combine several plants together to make small succulent gardens. As luck would have it, many of my new little pots contained 2, 3 or even more of the same plant, so it gave me lots of babies to work with. I love the color of this planter. It’s about 5 inches tall on the sides and about a foot across the diameter. 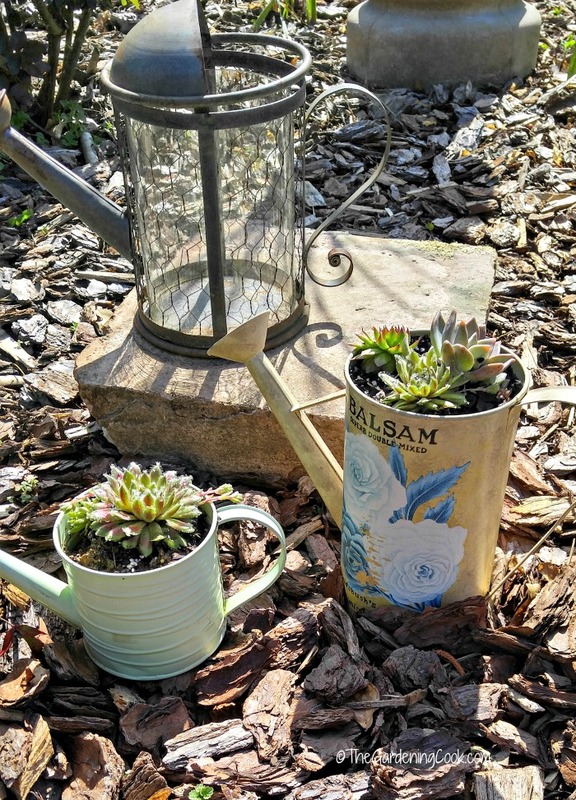 I have planted it to with Sedum treleasei, Echeveria harmsii – also known as Plush Plant, Lamb’s ear (cold hardy), aloe vera, Sempervivum – hens and chicks (cold hardy) and Sedum sieboldi (cold hardy). The white aquarium rocks add a nice touch to the planter. 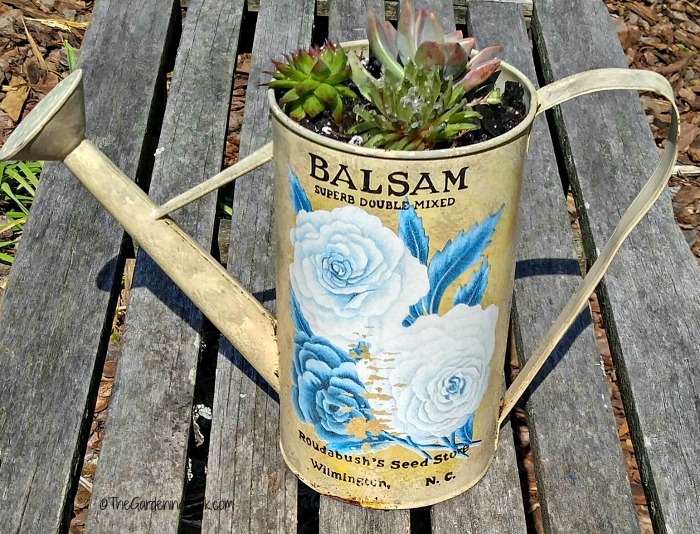 Watering cans are not just for watering! They make rustic succulent planters, too. My mother’s watering can is now doing double duty as a holder for Graptopetalum paraguayense – Ghost Plant, Sempervivum – hens and chicks, and Sempervivum firestorm. The bottom had started to rust out, so I did not need to drill any holes in it. I love that it originally came from Wilmington, N.C. – just about an hour away from me! Mum’s small green watering can now holds a cold hardy Sempervivum plant. It will send out babies that will fill the top and trail over the side in time, and I can leave it planted outside in the winter. The third watering can, also my mother’s, is too pretty to plant up. I placed it on a piece of flagstone and arranged all three in my test garden. It is the garden bed closest to my patio and is also the largest bed in my back yard. 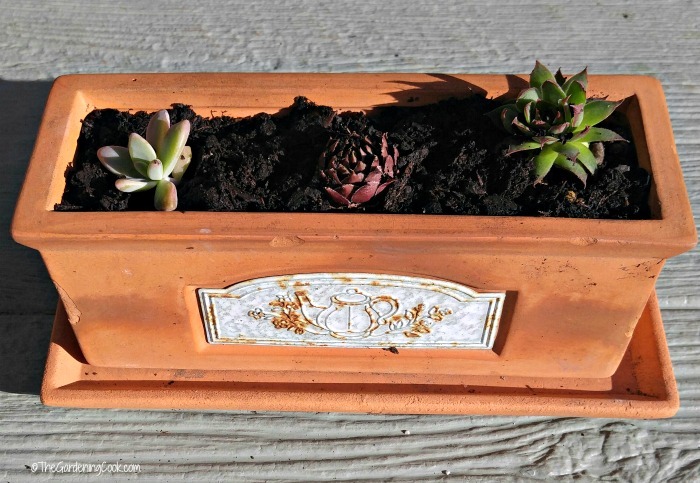 This large terracotta planter is the perfect size for a mini garden. I planted a large Senecio at the back for height. It also has a Senecio firestorm and Sempervivum planted as well as a couple of left overs from last year that had gotten leggy. I just planted them more deeply and they will grow just fine. My husband loves these fun succulent planters. 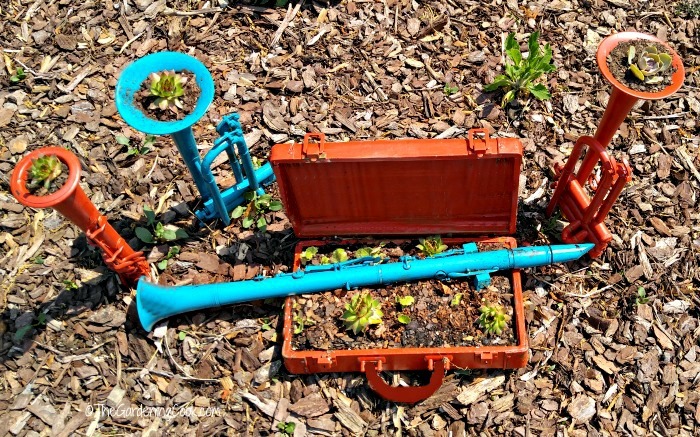 He came home one day with a box full of musical instruments and said “here is something for your garden.” I painted them in bright colors and used them as planters last year. Everything in them died over the winter. This year, they are planted with cold hardy hens and chicks. They should do jut fine overwintering next winter. A tall Senecio that had gotten very leggy last year adds a little tree like look to the back of this clay planter that got damaged during the winter. Even though the edge had chipped off, I still planted it up. If it holds soil, it’s a planter to me! The rest of the planter holds Graptopetalum paraguayense – Ghost plant, Graptosedum “Vera Higgins”, and Sempervivum – hens and chicks. 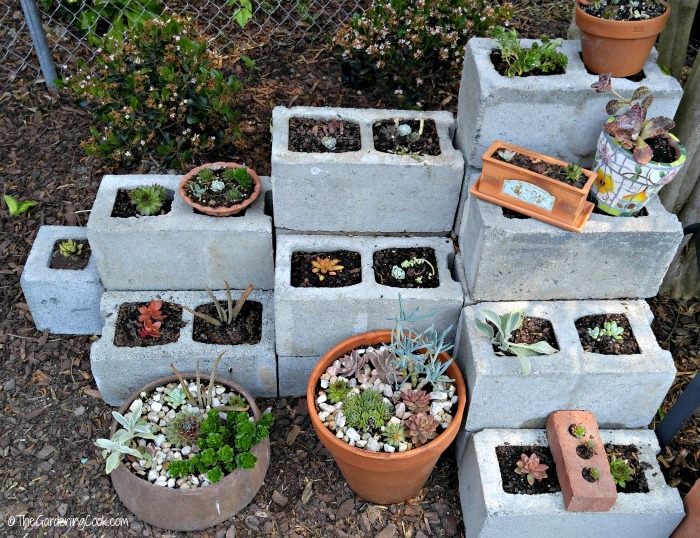 How about bricks for rustic succulent planters? 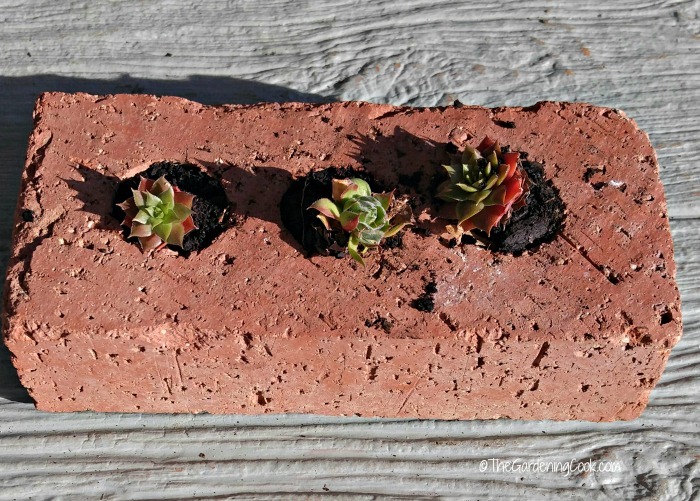 This clay brick has three small holes in it that are the perfect size for these tiny succulents. 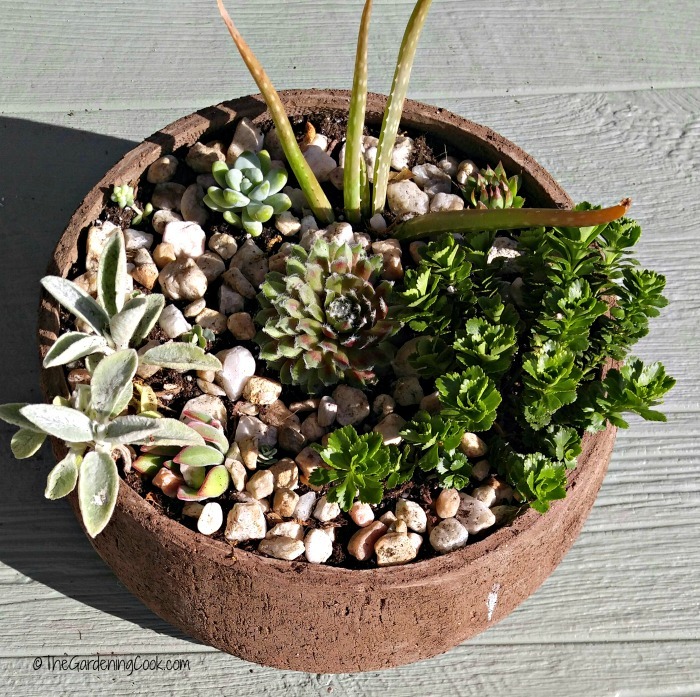 Clay pots age nicely and make great rustic succulent planters. 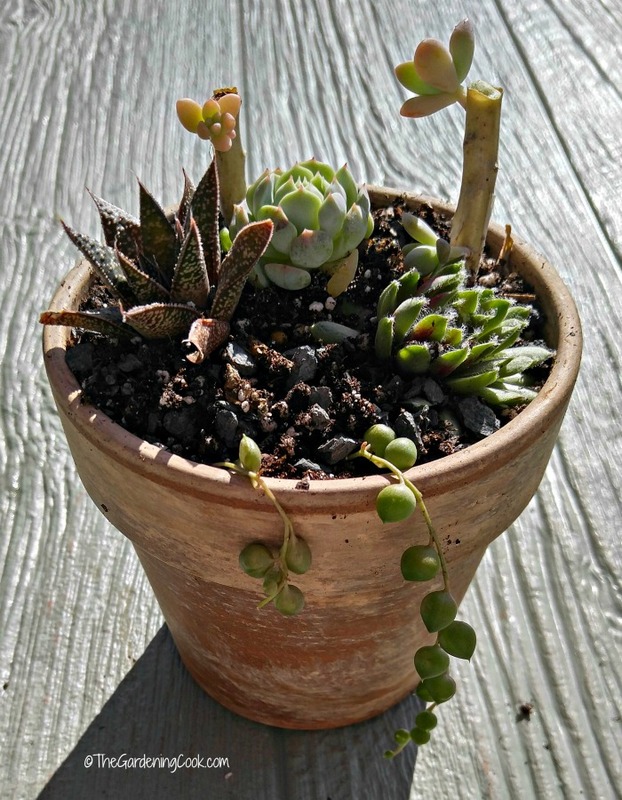 This small planter has a weathered outside to the clay and holds Echeveria derenbergii – Painted Lady, Senecio rowleyanus – string of pearls, Sempervivum pink cloud, Haworthia succulent, plus two succulents that got leggy to the point of being ridiculous, but I still planted them for interest. The ultimate in rustic succulent planters! My pots were all planted and I still had lots of succulents left over, so I headed out to my Southwest garden bed and gave my cement block planter a make over. Some succulents were left in pots and sunk in the soil (so I can bring them in next winter) and others were planted right into the openings of the cement blocks. The bigger succulent planters got arranged around the cement block planter for a lovely look. I can’t wait until the plants start growing and overflowing the pots, blocks and planters. These succulent planters could not be easier to look after. I only need to water them a few times a week and they can take all the sun that North Carolina will deliver this year! 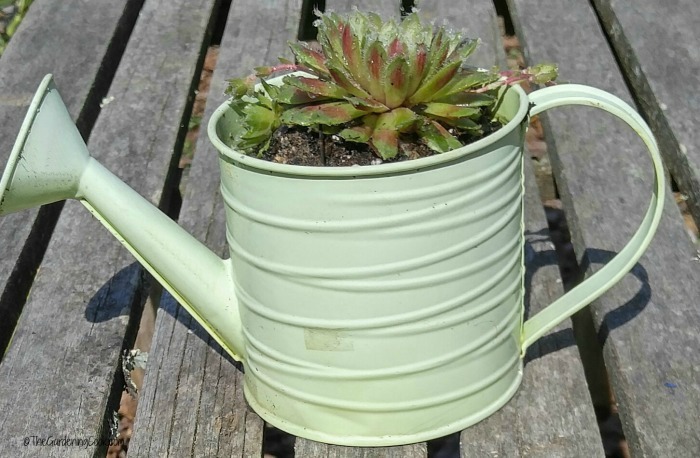 What sort of succulent planters have you come up with for your garden? Please share your ideas in the comments below. For more gardening inspiration, please visit my Pinterest gardening board. 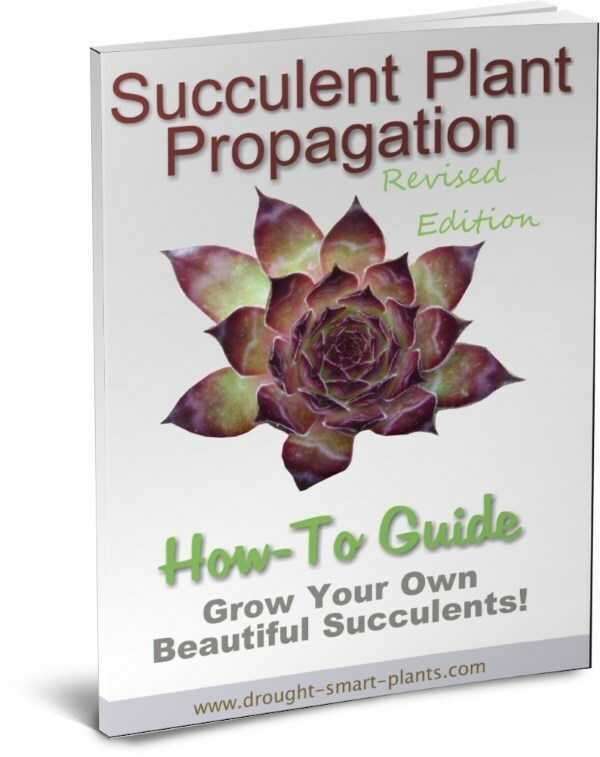 Want to know more about how to propagate succulents?This E-Book from Drought Smart plants gives a great deal of information in an easy to understand format. I love succulents because they come in so many neat shapes and colors. I love your ideas for the different planters. But my favorites are the watering cans! Those are special to me too, because they were my mother’s watering cans. Thanks for all the great suggestions, Carol. I have a couple of succulent planters that I love – one is a flat square black ceramic pot and the other is shaped like a shell. They’ve been perennial favourites in my garden for quite a while. Can you please tell where did you get the rust colored planter from?